There is something quintessentially Spanish about Goya’s portraits. But perhaps that is because what we have come to see as Spanish in art has been irrevocably shaped by his pictures. 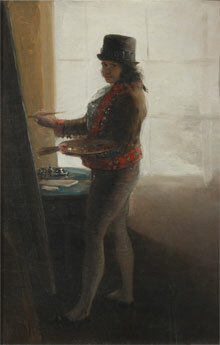 Like his predecessor Velazquez, Goya chronicled a critical period in Spain’s history – the Napoleonic invasion and the Peninsular War illustrated in all their horror in his famous ‘Black Paintings’ – and at the National Gallery we can now appreciate the characters involved whom he brings so vividly to life. Goya painted royalty and aristocracy, ministers and diplomats – but these are not the staid formal likenesses of previous generations. A large and arresting group portrait dominates the first room of the exhibition and introduces a tone of intrigue and bravado tempered by a light-hearted wit. 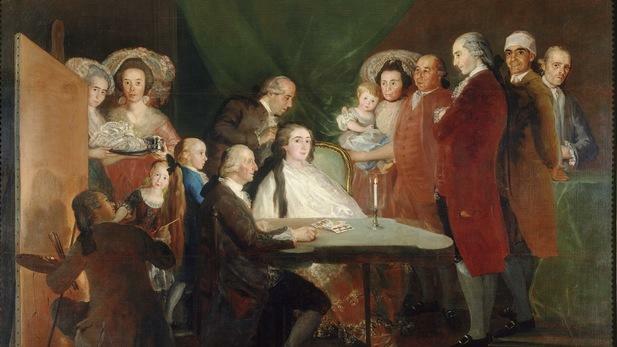 ‘The Family of the Infante Don Luis de Borbon’ (above, 1783-4) shows the younger brother of the King of Spain at a table with his wife as she has her hair dressed, other members of their household crowding around and the artist himself in the foreground shadows, his back to us as he paints the scene. 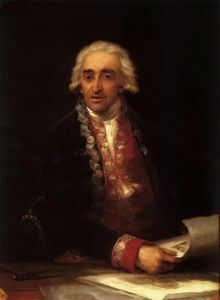 The Infante had been forced to marry in an effort to halt his overzealous promiscuity, and banished from court; Goya stayed with his household over several summers, also painting simple but beautiful bust-length portraits of the couple (‘Maria Teresa de Vallabriga y Rozas’, 1783, above right). In the group portrait the eyes of all the participants focus somewhere different, each has his or her own secret agenda – especially the two figures to the far right, one grinning out at us, the other skulking furtively behind, hand reaching into a pocket… In one concise set-piece Goya speaks volumes about the intricate network of relations in the exiled court, the outward theatricality hiding layers of scurrilous gossip and subterfuge. 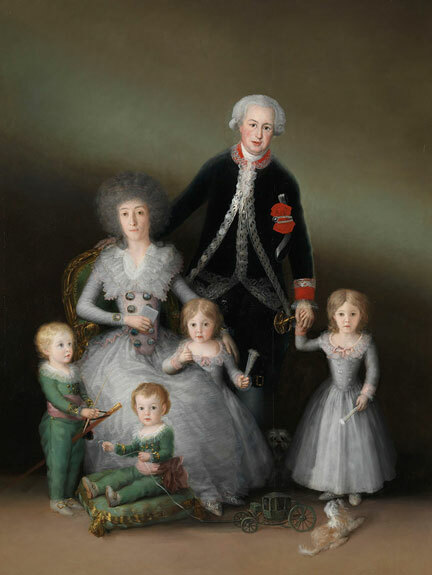 Next door there is a tender family portrait of the Duke and Duchess of Osuna and their children (above left, 1788). Perhaps influenced by the Enlightenment neo-classicism of David in France, Goya leaves the background empty; the figures are grouped in natural poses, the Duke leaning in in frozen movement, the children playful and the small dogs refusing to stay still – an appropriately avant-garde approach to depicting one of Spain’s most enlightened families. 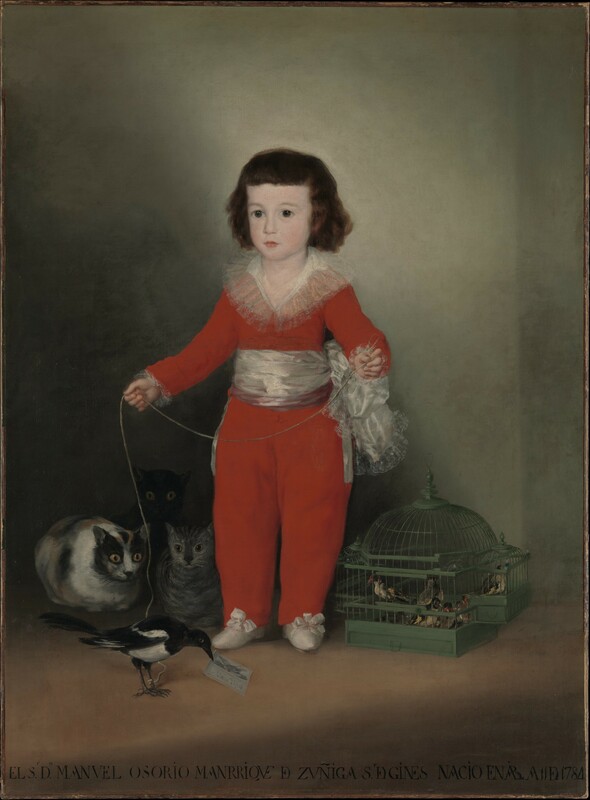 Nearby there is a portrait of a small child in a splendid red suit and silver sash (‘Manuel Osorio Manrique de Zuniga’, 1788, right) with his pet magpie on a string, looking out at us with cherubic innocence while behind him three crouching cats look on their intended prey with greed. There is a lively comedy to the picture that enhances what is already an affecting portrait. Then we meet some of the personalities of the new post-French Revolutionary administration – along with the artist himself, in the small ‘Self-Portrait before an Easel’ (left, 1792-5). Light streams in behind him, perhaps symbolic of the Enlightenment thinking embodied by the surrounding characters. There is Ferdinand Guillemardet, the French ambassador in an extravagant swagger portrait, wearing the uniform of the Directoire; there is Gaspar Melchor de Jovellanos, a writer and reformist politician, his quiet intellect symbolised by the statue of Minerva (below left, 1798), and Francisco de Saavedra, the Minister of Finance and man of action, painted with correspondingly rapid strokes; and there is the ruddy-cheeked poet, politician and lawyer Juan Antonio Melendez Valdes, whose highbrow, critical, moral intellect is incisively captured in this portrait (right, 1797). 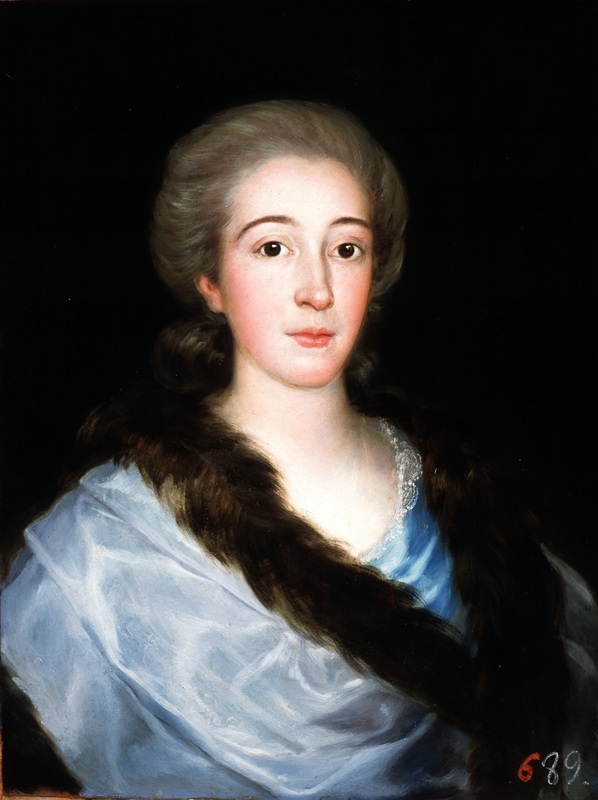 The Duchess of Alba is a highlight (below right, 1797); with her haughty expression outlined by thick black brows and the extravagant black lace mantilla she epitomises both Spanish tradition and feminine power. 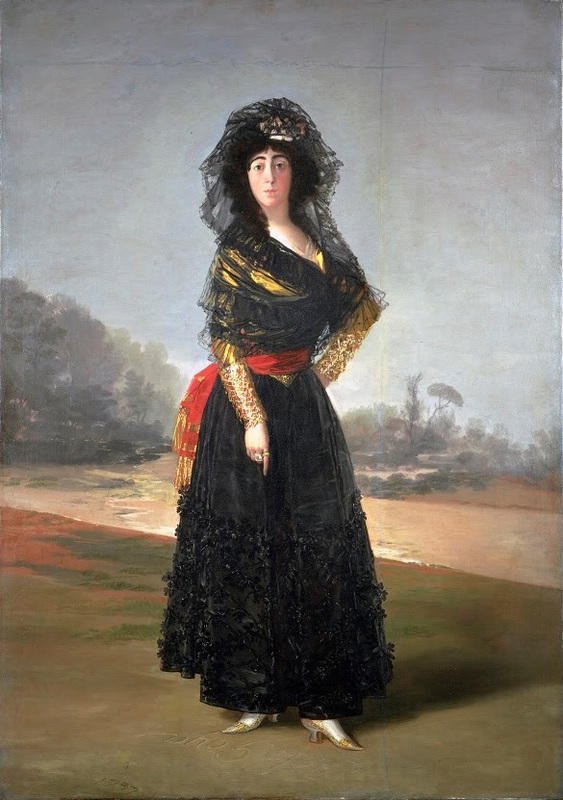 She points imperiously at the ground where an inscription reads ‘Solo Goya’, a proud indication of status by the artist that also reminds us of the extensive estates that the widowed Duchess owned – and her fiery temper. 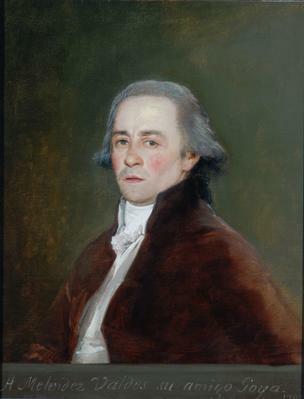 As well as his famous Black Paintings and Disasters of War etchings Goya also painted portraits of many of the protaganists in the upheavals of the early 19th century. 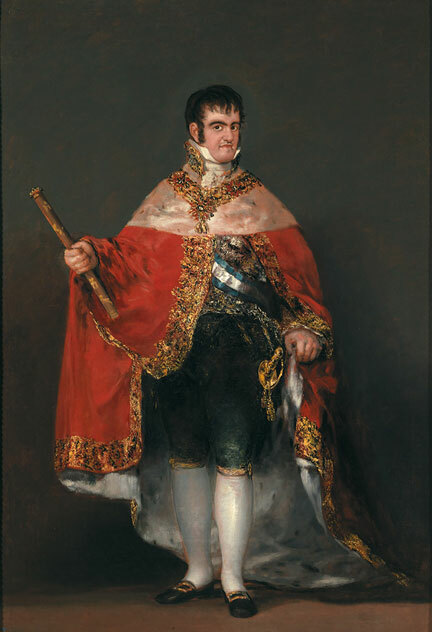 Charles IV was forced to abdicate in favour of his son Ferdinand VII in 1808, whom Goya paints with barely repressed irony almost smothered by the weight of his regal regalia, his short stature and stubborn expression eerily similar to that of Napoleon in Imperial guise. He was a narrow-minded reactionary, power-hungry and unenlightened, and probably did not sense the subtle subversion latent within his brazenly propagandist portrait (left, 1814-15). 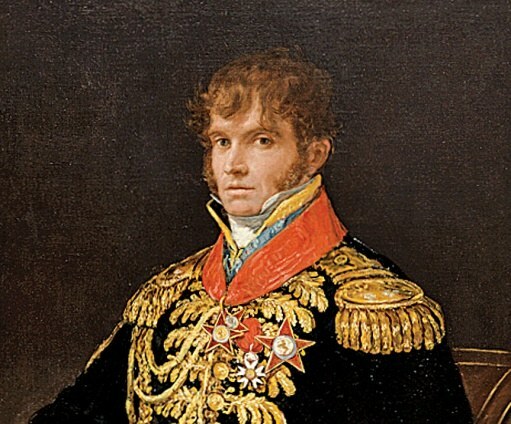 Goya also painted General Guye (below right, 1810), Governor of Seville under Joseph Bonaparte, who had been placed on the Spanish throne by Napoleon in 1808, and the Duke of Wellington, who led allied troops to recapture Spain and restore Ferdinand to the throne. In the next room are portraits of Goya’s friends and fellow artists; though no more or less incisive, the intimacy of these is in stark contrast to the preceding galleries. The most striking are those of Andres del Peral (below right, c.1798), the master gilder at court, who in turning his face towards us reveals its droop – the effects possibly of a stroke; and Juan de Villanueva (left, 1800-5), architect of the Prado, who is caught in mid-speech, endowing the portrait with a lively warmth and immediacy. 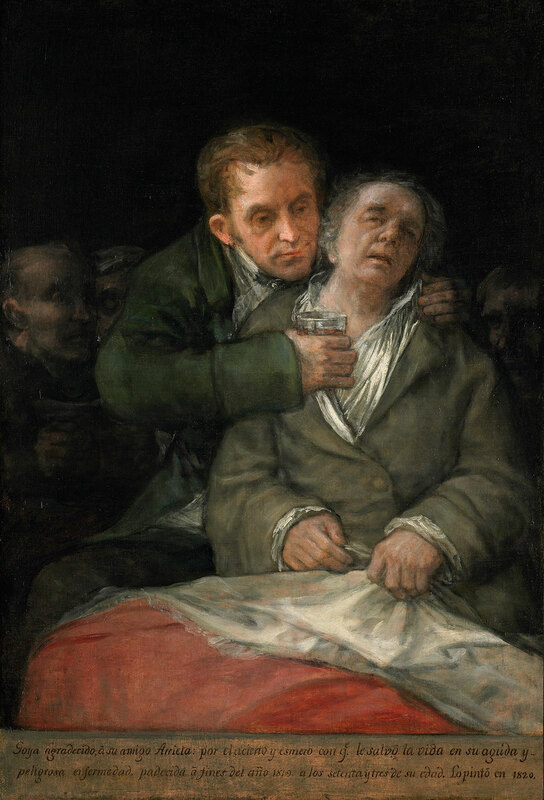 The centrepiece of the final room is the ‘Self-Portrait with Doctor Arrieta’ (below, 1820) in which the aging artist is propped up in bed by his doctor who offers him a cure; in an inscription underneath Goya gives thanks to Arrieta for saving his life. It is curiously old-fashioned, the text and the subject lending the religious air of a medieval manuscript or fresco. The painting is hung to face the exit, so that one can see it simultaneously with the group portrait of the Infante’s court hanging to face the entrance; it makes a joyous and satisfying conclusion, the two masterpieces representing youth and age, spirited ambition and disillusionment – and how far those pre-revolutionary days of 1783 must have seemed in 1820.